Lifesaving (and life-changing) medical advancements made possible by 3-D printing are rapidly altering the face of surgery and surgical success. Consider what's already begun: Creating bio-personalized hip implants, Replicating vertebra for spinal cord injuries, and Printing an exact heart model to better plan a surgical repair strategy. While physicians and medical specialists are only in the infancy of tapping 3-D printing potential, the technology is already being used in ways that stretch the imagination. And now we're stretching it even further. Advancements in 3-D printing are entering the arena of fetal surgery - giving hope to unborn babies during procedures in which every second counts. Bioengineers and the multidisciplinary team of fetal surgeons, maternal fetal medicine specialists and fetal radiologists at the Colorado Fetal Care Center at Children's Hospital Colorado have joined forces to utilize 3-D MRI imaging to print 3-D models of fetal defects. In a surgical case performed at Children's Colorado in April 2015 - a first of its kind - a 3-D replica of an unborn baby's spine was created to assist in a fetal surgery for myelomeningocele, a common form of spina bifida. This not-so-rare birth defect - spina bifida is diagnosed in 1 of every 1,000 babies born - occurs when a section of the neural tube that runs along the spine fails to close. It can have devastating consequences for its young victims. Myelomeningocele can mean an inability to walk, lifetime incontinence and the need for multiple surgical procedures during a child's life to treat complications (such as hydrocephalus, which results in brain swelling). Upward of 80 percent of those diagnosed will require a cerebral shunt (in effect, a brain drain) early in life to treat hydrocephalus. While a National Institutes of Health study showed that myelomeningocele repair in utero can dramatically decrease the need for these shunts, surgical treatment presents challenges. Some spinal defect openings are quite large and require a patch to close; yet their actual size is only discovered at the critical surgical time. Significantly, one of the key limitations of fetal intervention is time. Longer surgery times increase the risk to the mother and fetus, including preterm labor, maternal bleeding and exposure of the fetus to anesthetic gases, which can affect brain development. This is where 3-D printing is helping us pioneer fetal surgery advancements. 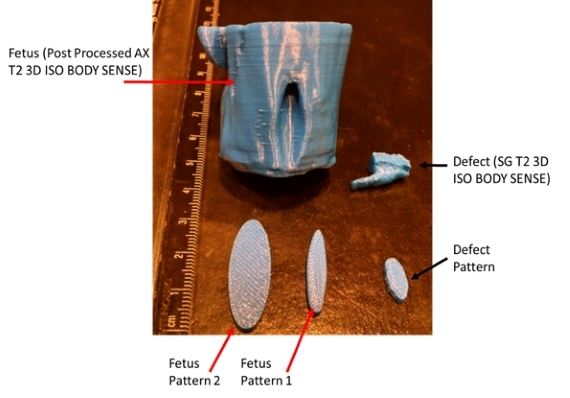 The Colorado Fetal Care Center team - a part of the Colorado Institute for Maternal and Fetal Health - is advancing 3-D imaging and 3-D printing to create models that allow us to predict the need for a patch, and to subsequently aid in patch design (most importantly, its size). The availability of a patient-specific model prior to surgery allows for better operative planning. The ability to use 3-D printing to create a template of the dural and skin defects allows tailor-made dural and skin patches to be created, which decreases operative times and improves outcome success. These 3-D models have become regular tools in our efforts to lessen the debilitating effects of spina bifida, and once born, give these children a better quality of life. Leveraging 3-D technology is a huge step forward in the standardization of fetal surgical care - for this fetal condition and others. Eventually, 3-D printing will be used to not only aid in the preoperative and intraoperative planning and care, but also to produce a "living" patch using the patient's own cells to aid in the healing process. We are only beginning to understand implications of 3-D technologies in medical applications, and ongoing research holds tremendous potential for the development of patient-specific therapies. Just recently we've watched our bioengineers create these models, and already we can see the future of surgical success starting to take shape.